Zona Río literally translates into English as River Zone. This name is owed to the nearly dried Tijuana River, which divides Zona Río. The river is crossed by many bridges to allow traffic between the west side of Zona Río, located at the west-center of the city, and the east of Zona Rio, located in the east-center of Tijuana. One of the most important avenues in the whole city of Tijuana is the Paseo de los Héroes (lit. "Road of the Heroes"). Along this avenue are located most of the financial, commercial, and touristic businesses of Zona Río and the entire city. Insurance companies, numerous banks, such as BBVA-Bancomer and Banamex, and shopping squares, such as Plaza Río Tijuana, the largest mall in the city, have their headquarters in this avenue. The cultural heart-point of the city, the Tijuana Cultural Center, is on Paseo de los Héroes. Two recently built skyscrapers are exclusively occupied by two different hospitals and its corporations. Most of the high-end hotels of the entire city are located in Paseo de los Héroes avenue. Paseo de los Héroes is also noted for its many monuments and sculptures, like the Monumento a la Raza (Spanish for Monument to the Race), the Abraham Lincoln statue, the Ignacio Zaragoza statue, the Cuauhtémoc statue, the Lázaro Cárdenas statue, and others, to which the avenue largely owes its name, Road of the Heroes. During June 2008, Tijuana was hosting the CowParade. Along with the also popular Avenida Revolución, Paseo de los Héroes holds many of the artistic cows, in such popular places like the Monumento a la Raza and the Tijuana Cultural Center. In contrast to Paseo de los Héroes or Aguas Calientes, this is not one of the main avenues of the whole city, but rather only of Zona Río. This avenue is the main gastronomical corridor of Zona Río, offering the widest variety of gastronomy in the entire city. There are restaurants offering food from Thailand, Mongolia, Greece, Brazil or Israel, not to mention the typical Italian, Spanish, French, Argentinian, Chinese and American foods, plus the widespread Japanese sushi. As regards of Mexican food, the common tacos, Baja California-seafood, and the antojitos (Spanish term for traditional Mexican food), they are found almost everywhere in the avenue. This is one of the most important and largest avenues in the city, together with Paseo de los Héroes, with both crossing nearly the entire city. Prior to the opening of Tijuana's new airport at Otay district in 1958, the city's former airport was located along present-day Blvd. Agua Caliente. Also one of the main gastronomical corridors in the city, and a touristic and commercial avenue, Blvd. Agua Caliente may be a combination of both Paseo de los Héroes and Blvd. Sanchez Taboada, but with a characteristic of being the place where sports auditoriums and stadiums are located. The Agua Caliente Hippodrome and Racetrack is located here. The Municipal Auditorium of Tijuana, home of both of Tijuana's basketball teams, and the Estadio Casas GeoCaliente Stadium, home of the city's newly formed soccer team. 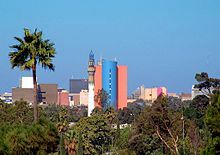 The tallest buildings of Tijuana, Las Torres (officially Plaza Agua Caliente & Grand Hotel Tijuana), are located here, along some other buildings and public hospitals. Paseo del Centenario ("Centennial Avenue") is also another important avenue within the area. The Municipal Palace of Tijuana is located here, along with the State Government Center of Tijuana. New City Residential is located here, as well as the Tijuana General Hospital and many other notable buildings. ^ "Plaza Río Tijuana". Retrieved April 24, 2011. ^ Centro Médico Excel on Emporis. ^ Edificio GILT on Emporis. ^ Edificio Ventura on Emporis. ^ Torre Bellavista on Emporis. ^ Torre MOL on Emporis. Wikimedia Commons has media related to Zona Rio. 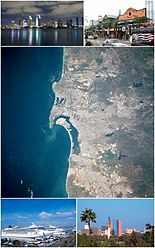 Wikivoyage has a travel guide for Tijuana/Zona_Rio. This page was last edited on 21 August 2018, at 06:11 (UTC).